Picture this nightmare: You walk into an interview for your dream job, shake hands with the hiring manager, sit down, and then realize you’ve arrived completely empty-handed. We’re talking no copies of your resume, no pen and paper for notes. Unfortunately, your lack of preparation may have just cost you your dream job. To prevent this from happening, you should start preparing for your interview as soon as a company gets in touch with you about your candidacy. Use this comprehensive checklist to make sure you have everything you need to make a good first impression in the job interview. This way you’ll show up prepared 100% of the time. We’re about to outline a significant amount of paperwork you need to bring to a job interview, so first things first, you’ll want to have a folder where you can neatly store these documents. This simple act also shows you’re organized, says Denver-based millennial career coach Jenn DeWall, which is a soft skill many employers look for in candidates. You most likely already submitted your resume when you applied for the job, but don’t assume the interviewer will have a copy of it on hand. “Hiring managers get busy and sometimes forget to print out your resume,” DeWall says. Although your resume should include your contact information, and business cards may seem old school, it can’t hurt to bring them with you, says millennial career coach Anastasia Button. They’re easy to carry, and “you never know if someone is going to ask for one,” Button says. It’s always better to have a few handy, just in case. If you’re in a creative industry—like advertising, journalism, graphic design, architecture, or fashion—you should bring samples of your work that you can give to the interviewer. “Offer to send your full portfolio electronically later on,” Button says. Depending on what you do, you may also want to have a sheet that showcases positive feedback you’ve received from past clients on your work. If the interview goes well—better yet, when the interview goes well, the hiring manager might ask you for references on the spot, so you should have a list prepared with their contact information. Theoretically, you could just email the interviewer this information when you get home, but DeWall says that’s a bad approach. “You want to make sure you give the company everything they need to move forward with the hiring process as quickly as possible,” she explains. Taking a few notes during your interview can be beneficial for a few reasons. For one, it shows you’re actively listening to the interviewer and engaged in the conversation, while also ensuring you won’t forget important details about the job. Moreover, “you can refer to your notes, later on, to send the interviewer a personalized thank-you email,” Loock says. Just make sure you ask the interviewer for permission before taking notes, and “don’t take so many notes that you’re not making eye contact,” Loock says. Pro tip: Bring several pens with you in case your favorite one runs out of ink, DeWall says. How does the company define and measure success? What’s the most important thing I can accomplish in the first 60 days? What do you do to encourage camaraderie and collaboration among co-workers? How do managers provide feedback to employees? Job interviews are nerve-wracking. One way to reduce stress before the interview and build confidence is to jog your memory by looking at notes of things you want to mention during the interview, such as specific skills or anecdotes that highlight your strengths. 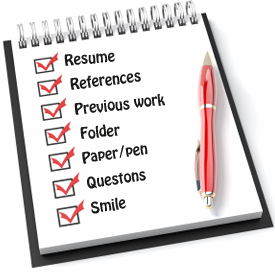 DeWall recommends creating a “great list”—a short summary of your accomplishments, organized by skill set—that you can review before you walk into the interview. These achievements should be tied to the job responsibilities, DeWall says. For instance, if you’re interviewing for a management position, you’d want to mention the last project you oversaw and describe how you exceeded expectations. This might seem like a no-brainer, but it’s still worth mentioning, Button says. You may need to provide photo ID to enter the building, so check with the employer beforehand to find out what the building’s security requirements are. The security guard may ask you the company you’re visiting, the name of the person you’re meeting with, and what floor they’re on. Confirm all of that information when you set up the interview, so you aren’t fumbling in the lobby before your big meeting. It’s time to show off those pearly whites! Before you cringe, consider the benefits of arriving with a positive attitude: “Smiling sounds corny, but employers want to see that you’re enthusiastic and excited about the position,” Loock says.